Actress Kristin Rudrüd (who played William H. Macy’s wife in the Coen brothers’ film “Fargo”, which was of course set in…). 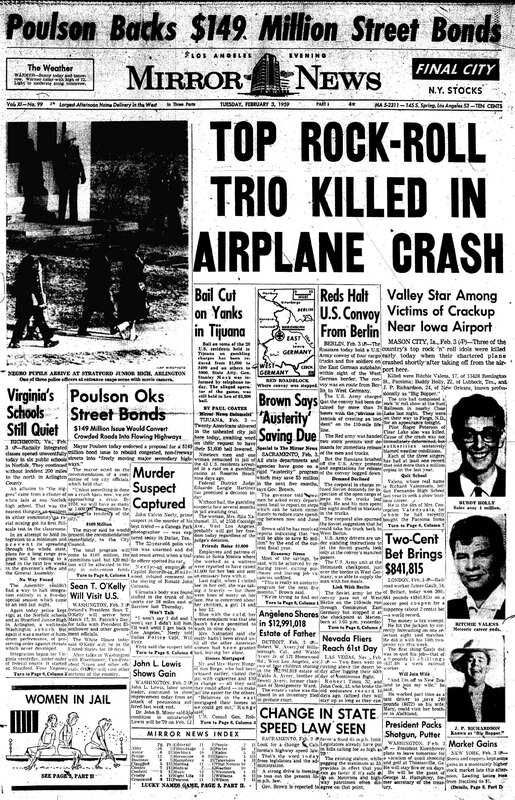 But in February, 1959, rock and roll was just reaching Fargo. Bobby and a couple of friends had formed a band two weeks earlier. Bobby came home from school for lunch, and found bad news on the doorstep. 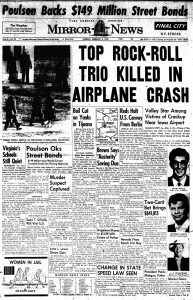 Headliners Buddy Holly, Ritchie Valens and The Big Bopper had been killed that night in a plane crash, on their way to Fargo. A call went out from KFGO, Fargo’s Top 40 station. Was there a local group that could step in and help the show go on? 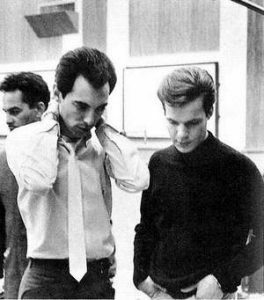 Bobby’s mom ran out to buy the boys matching sweaters and ties, his dad came up with the name The Shadows, and the boys cram-rehearsed all the Buddy Holly songs they could play. Though the scars of that night haven’t yet healed (see ‘American Pie’), Bobby and the boys were a hit. By June they had recorded a Bobby-penned Buddy Holly-cloned single, ‘Suzie Baby’, virtually indistinguishable from the master himself. The song went world-famous in Minnesota. The boys decided they needed a pianist, and auditioned a kid from Hibbing who introduced himself as Elston Gunnn, but whose real name was Bobby Zimmerman. He played a few gigs with The Shadows, then left for Omaha where he had gotten a job as a carburetor out at the hot-rod races every Thursday night. Sounds fabricated? You can see it, right here. Elston also recalled that Vee “had a metallic, edgy tone to his voice and it was as musical as a silver bell.” Vee for his part remembered Elston Gunn “played pretty good in the key of C.” But we get ahead of ourselves. The Elston-less Bobby Vee and The Shadows were signed by Liberty Records in LA and assigned to the tutelage of a Texan high-school dropout, the 19-year old Snuff Garrett. Snuff went on to work with Sonny Curtis, Johnny Burnette, Brenda Lee, Roy Rogers, Gene McDaniels, Buddy Knox, Walter Brennan, Gary Lewis & the Playboys, Del Shannon, Sonny & Cher, Cher and JJ Cale. He gave Leon Russell and one Phil Spector their first jobs in the business. Walter Brennan and Phil Spector—I’m not making it up. Snuff took Bobby to Norman Petty’s studio in Clovis, NM, where Buddy had gotten his start. Their version of an old R&B cut by The Clovers (who did the original version of the Leiber-Stoller classic ‘Love Potion #9’), ‘Devil or Angel’, went to #6 nationally, as did their next single, ‘Rubber Ball’ (co-composed by Gene Pitney under his mother’s maiden name). Snuff took a shopping trip to New York to shop at the Brill Building, where he was offered a tune by the young husband-and-wife team of Gerry Goffin and Carole King, who had just had their first #1 hit with The Shirelles’ ‘Will You Still Love Me Tomorrow’. Dion had recorded it, but wasn’t planning on releasing it. Snuff felt that the song lacked a kick, so Carole added the “My tears have fallen” intro. It sounded like this. Bobby’s version went to #1, his only one, Goffin-King’s second of many. 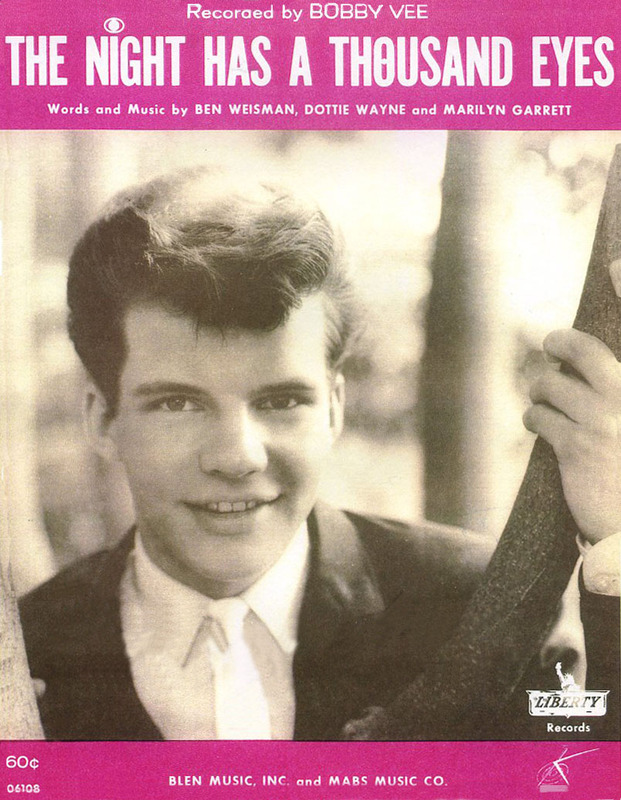 ‘Run to Him‘ – #2, written by Goffin and Jack Keller, another member of the Brill-based Aldon Music stable, which had 54 top ten songs between 1960 and 1963. 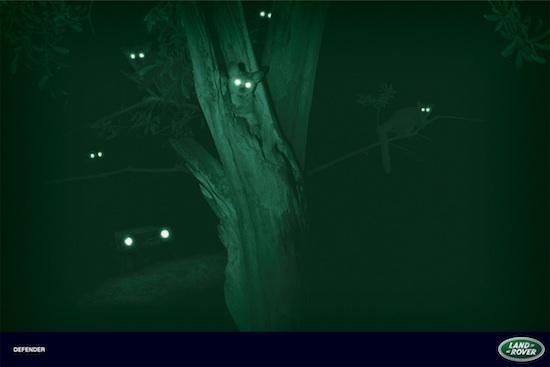 Both of these seem to me clearly influenced by Roy Orbison’s ‘Running Scared’ – conflicted love triangles in which the narrator is wrenched with fear and anxiety, 2’15” melodramas in a minor key, climbing single-mindedly from the tense git-go to an operatic climax without a detour into a chorus. Oh, the drama in those three songs, fantastical passions for a bored and horny 15-year old boy from the suburbs, each one grist for an entire soap. It was kept out of the top spot by Paul & Paula’s ‘Hey Paula’ and The Rooftop Singers’ ‘Walk Right In’. Competition was stiff before The Fab Four took over. 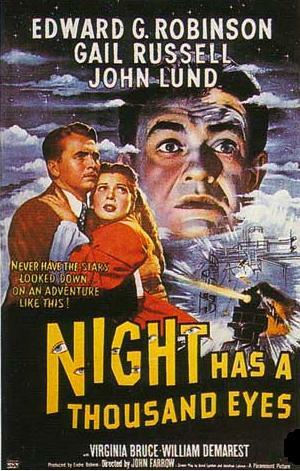 Bobby’s ‘The Night Has a Thousand Eyes’ was written by Benjamin Weisman, Dorothy Wayne, and Marilyn Garrett. 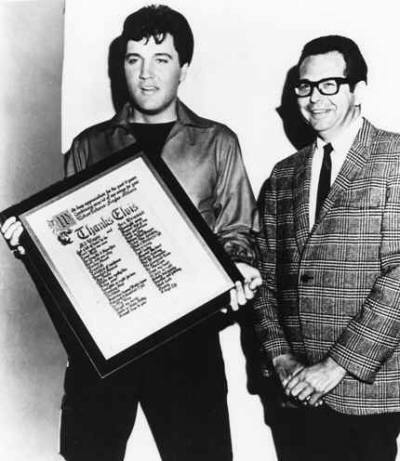 I don’t know nothin’ about the two ladies, but this is what Elvis (Presley) had to say about Mr Weisman (at a bacchanalian post-Vegas run party, shortly before The King died): “I want you all to meet Ben Weisman. The man who has written more songs for me than any other writer – 57! I want to hear it for this man”. What can I say about it? Not too much, really. It’s a pop song. Charming and catchy. The stuff of my innocent youth. I readily admit that when I was listening to it in 1962, I didn’t visualize it like this freakish, bizarre clip. The director is uncredited, but I sure hope he wasn’t allowed out unsupervised. 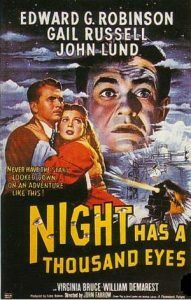 The 1948 film noir in which Edward G. Robinson plays a New Orleans nightclub fortune teller who unwittingly becomes a psychic, bleakly predicting all sorts of mayhem. Or the theme song from the movie, performed here by Harry Belafonte (with the Zoot Sims Quartet), here in a cool live clip by Stan Getz. Bobby’s song has had numerous covers, including by Jennifer Connelly (from the movie “Dark City”, better on the eyes than on the ears) and American Idol Vegas Week, one of the ugliest, most aesthetically offensive clips I’ve ever had the misfortune to watch 8 seconds of. So, Bobby, what shall we say in parting? R.I.P. Thanks for the hits, thanks for the mini-dramas, thanks for the memories. We’ll remember you fondly. And who knows, maybe Elston Gunnn will play ‘Suzie Baby’ or ‘Take Good Care of My Baby’, or even ‘The Night Has a Thousand Eyes’ at the ceremony in Stockholm next month. Apparently that’s Elston Gunnn, with a triple n. See . 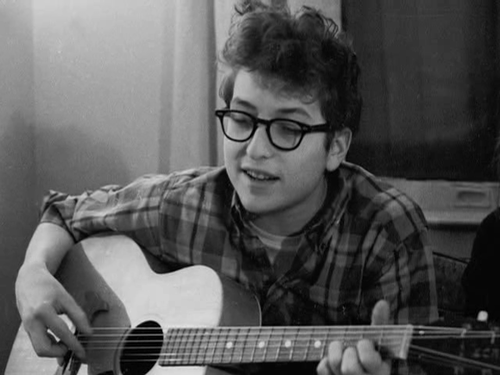 Dylan did a nice version of Suzie Baby. Great article. Really enjoyed it. Thanks. 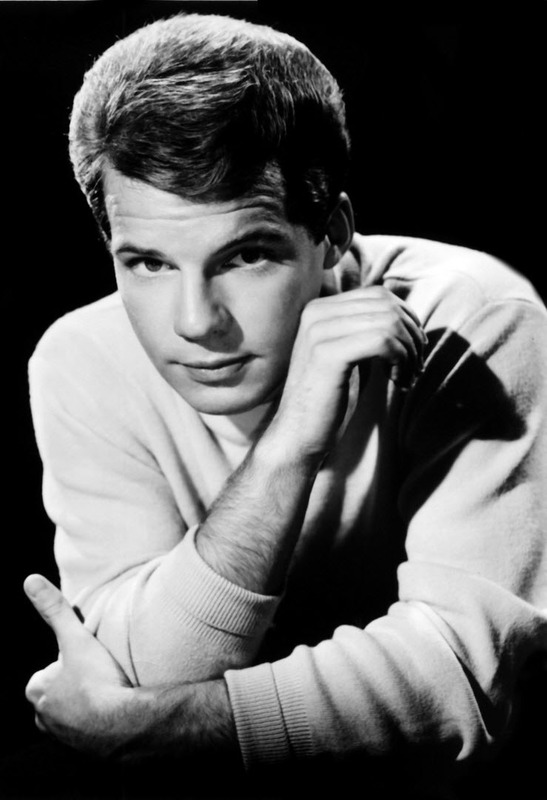 My favorite Bobby Vee has always been “Take Good Care of My Baby.” The Elston Gunn connection is both fascinating and timely, I never would have guessed these two ever crossed musical paths. I agree Elston, Bobby’s voice was as musical as a silver bell.